I'm actually loving this bootie, it's just the right amount of grey, fur and wedge and I would die to see it paired with some fabulous tights. 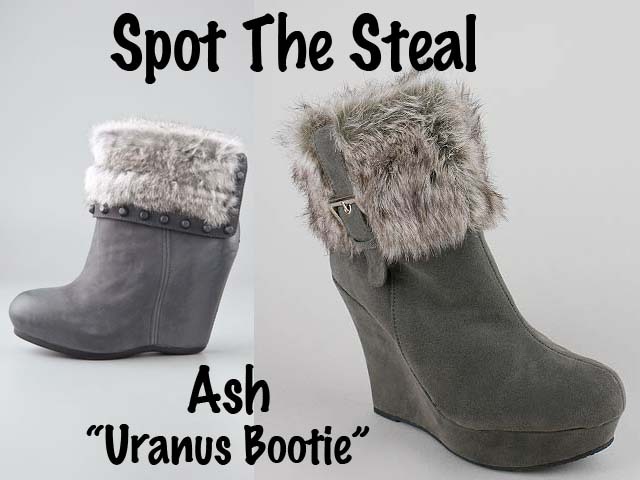 The Ash "Uranus" runs for $285 where the GoJane version is only $23.95, Steal! What do you think, do they look a like? Those are Great ! They look comfortable. It is funny, of those two I think I would prefer the steal actually. But then again the studded look for the splurge is wonderful too. Arrgh, can't choose. They are both good looking.